Waterproof clothing is an essential for anyone working in wet environments. Keep dry with our range of waterproof jackets and rain suits. The navy waterproof jacket is an ideal, lightweight jacket to keep clothes dry from the rain. This waterproof jacket is made from PVC-coated polyester and features an inner storm flap to prevent moisture from seeping through. 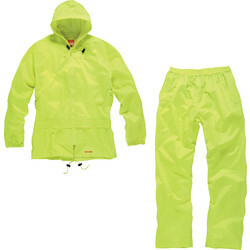 Toolstation also supply matching waterproof trousers for complete weather protection. For a durable weatherproof solution, the hard-wearing Scruffs waterproof rain suit will ensure long-term rain protection. 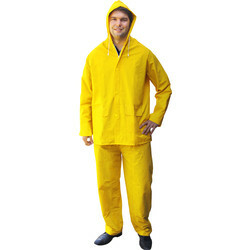 This waterproof rain suit is fashioned from tough PVC fabric and complete with waterproof taped seams. With a waterproof rating of 3000mm, this rain suit is manufactured from tough PVC fabric and fitted with waterproof taped seams. Multiple drawcord adjusters and stud fasteners provide a watertight solution to keep you working in bad weather. 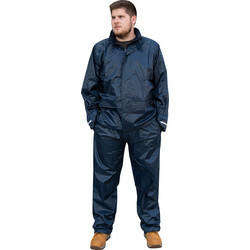 A more cost-effective waterproof suit is also available to purchase; this waterproof 2-piece suit is made with double PVC coated polyester and has 2 handy patch pockets. Suited to all body shapes, all our waterproof clothing is available to buy in sizes medium, large, and extra-large.